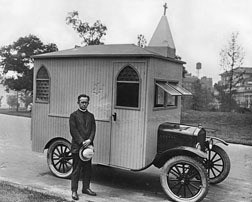 Were it not for the idea of the “Mobile Church,” the number of Christian congregations in the United States would be significantly diminished. I don’t know the current stats, but mobile churches are everywhere. In small towns and large cities across the U.S. there are thousands of churches that rent local school facilities, hotels, YMCA facilities, and even the worship facilities of other congregations during times other than Sunday mornings. Whole businesses and ministries have been started to help these congregations with their unique challenges. For the entire twelve years that I pastored our former church, it was (and still is) a mobile church. We started in an elementary school cafeteria (six weeks), then moved to a high school cafeteria (six years), then we moved to the local YMCA (six years), and this summer we moved to another local elementary school which we LOVE! Don’t get me wrong. There are some serious challenges and some scary things that mobile churches have to deal with, but that’s true for every expression of congregational life. Like all churches, we learn to deal with our unique challenges, and thrive on the benefits of using our particular approach to doing church the way we do it. Below is a short list (though it could be longer) of some key benefits to being mobile. Feel free to add your own, or share your particular experiences or questions in the comment section below. Benefit #1 – Someone else is paying the mortgage – Most churches that have their own buildings and land have spent hundreds of thousands of dollars (if not millions or tens of millions) to secure their land, develop it, and build their buildings on it. The maintenance and utilities, not to mention the principal and interest payments on these facilities causes lots of pastors to lose sleep, health, and even their jobs when they can’t pay the bills. It also forces many of them to constantly have to talk about money. Mobile churches spend money on facilities too, but by comparison, it is far less than congregations that are paying off church-owned properties. For the first six years of our church’s existence, we paid $500 a month to rent a very nice high school campus that already had all the space we needed. That leads to the second benefit. Benefit #2 – More resources for ministry – For many mobile churches, the majority of the budget can be used for actual ministry since it’s not being poured into maintaining a church facility. That includes adequate staff, resources, funding for special ministry projects, and opportunities that many congregations simply can’t consider. Benefit #3 – More room for volunteerism – If you’re pastoring a mobile church, you know that it takes a lot more people to get things done. In the case of our church, about 70% of the congregation is involved in some kind of volunteer service based on gifts, abilities, and needs. I met with another mobile church pastor this morning who shared that 90% of the adults in his congregation were volunteering in some way. Our volunteer teams are a primary way that people learn to hang out together, work together, and develop friendships that transcend church volunteerism. This benefit of mobility also gives people who would otherwise never serve (or be asked to serve) a chance to feel like a part of the family. Benefit #4 – The church in your house – If you don’t have a nice Christian education wing, or access to a church facility mid-week, but you still want your people involved in community, there is only one solution; you have to open your homes. Mobile churches are typically better at mobilizing community groups (e.g. home groups / care groups, or whatever you call them at your church). For mobile churches, these groups are a matter of life or death. But they are also a huge benefit to congregations who are looking for relational discipleship. I jokingly tell our church that we have more kitchens and bathrooms than any other church in town because so many of our people open their homes for ministry. In my experience, churches that have facility-oriented approaches to ministry have a much more difficult time starting small groups because many of the members will simply want everything to be done at the church’s facility. Benefit #5 – Strategic partnership with your host – In three of the four locations where we have met over the years, we have been able to be a huge blessing to our hosts. When we were at the high school, we donated chairs (which we used on Sundays), and lots of cool stuff to the teachers whose classrooms we used for Children’s ministry. At the YMCA, we actually painted several rooms, put new air conditioners on the roof, and regularly did grounds-keeping work for them because they didn’t have the staff or funds to do it themselves (and we wanted the place to look nice on Sundays). At our current location, we have donated equipment and resources that benefit the school, and create good will toward our church (which doesn’t hurt our witness). Benefit #6 – Location, Location, Location! – Some churches discover, over time, that their location is actually a hindrance to their ministry. I have a friend who pastored a congregation in a neighborhood that dramatically changed in the decade before he arrived. The entire population around the church changed from a middle-class, English speaking demographic to a primarily spanish Speaking demographic. The members of the church were having difficulty due to cultural and language barriers being a good witness in the neighborhood, so they decided to witness in a different way! My friend did something radical. He (and the congregation) donated (Yes! Donated!) their building and land to a Spanish-speaking congregation and moved to a local high school. Now they are growing and thriving as a mobile church, and since they can communicate with their neighbors, they are able to be a light in the city where they worship. The nice thing about being mobile is… if your location is not conducive to your mission, you can move if you want or need to. Benefit #7 – Creativity (another way of saying you have to stay flexible, and that’s a benefit!) – In mobile churches, you have a chance to change things up quite a bit if you need to. You can move your stage around, move your chairs into different configurations, set up classes the way you need to or want to, and experiment with different approaches to space-usage. Why is this a benefit? In some churches, if you move the organ, or if you sit in sister Alice-Faye’s pew, or you take down the mural of the golden-haired Jesus painted and donated by a founding member of the church back in 1943, you could get into serious trouble! In a mobile church, change is par for the course, and it keeps the congregation from getting too comfortable with the status quo. Well, I could go on and on, but I’d love it if some of my other mobile church pastor friends or members of mobile churches could chime in. Again, there is a lot to complain about in every kind of church, so let’s keep it positive or inquisitive. I hope this has blessed, and I’d love to see what you have to add below. SO! Jump in mobile church pastors and members. What would you add?